David J. Williams' debut novel came out back in 2008, but it came to my attention after I wrote up piece on military science fiction for io9. In it, I looked to an argument that military science fiction generally avoided some of the root lessons and causes of warfare, which helps to dictate how the actions and world around the characters would play out. Williams’ books were recommended by a couple of readers as a good example of this sort of storytelling and world, and I was eager to see how his books lined up with what I had been hoping to see in a military science fiction book. The Mirrored Heavens is a fun, action packed read. Taking place in 2110, a terrorist act, perpetrated by an unknown group, the Autumn Rain, destroys major construct in space: the Phoenix Space Elevator, shortly before it is activated. Constructed following a Cold War between the United States and a Eurasian Coalition, the destruction of the space elevator throws the main actions of the story together. U.S. counterintelligence agents Claire Haskell and Jason Marlowe, move to seek out the origins of the attack, while several other characters move through the story to their own agendas, culminating in a fairly exciting conclusion. What works exceptionally well is Williams’ approach to the story is the surrounding back story and world building that helps put warfare into context. Throughout my studies, I’ve found that warfare is not an isolated event, even it is generally treated as such in fiction and in film; it is a complicated and convoluted process of politics, public figures, implementation of policy and foreign relations, before any of the bullets begin to fly. Williams, with a degree in history from Yale, seems to understand this, and has begun his trilogy (followed by The Burning Skies and The Machinery of Light, which is coming out soon) with a strong start. 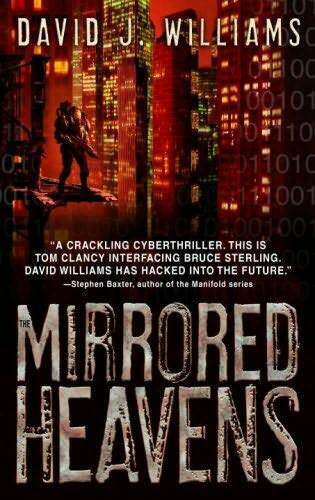 The Mirrored Heavens is a thriller from start to finish. Williams adds on the action from the get-go, and rarely lets up from there, blending in military science fiction and cyberpunk together to form a pretty unique, high-octane vision of the future. There were points where I just blew through the book. Williams' short, to the point writing style really suits this sort of story, and it really moved things along. Throughout, the actions in the story are well articulated and clear, something that I've seen some writers stumble with. Moreover, the action in the book ultimately does help to support the story, pushing each storyline along bit by bit. The action is both a good thing and a bad thing, however. While it does serve the story well, The Mirrored Heavens is the literary equivalent of a video game (and it comes as no surprise that Williams worked in the video game industry before turning to writing). At points, it overwhelms the story, and looking back, I have a hard time pulling out a detailed summary of what happened over the course of the book, simply because there is so many lasers, guns and missiles that there were points where I had to put the book down to find something else to do, to clear my head and try and make sense of what was going on. Taken as a whole, the story becomes very clear at the end, but that is of little help prior to that point. Ultimately, the book simply feels unbalanced, with more towards world building and action, and less on the story at hand and character building to fill in, and I'm hoping with the sequel, The Burning Skies, that there'll be a bit more in the way of that. That being said, the book has a significant leg up once you reach the end, and find that everything that has been read through really comes to a fine point, one that really leaves the reader looking for more, and fortunately, there are two further books in the trilogy to read through to get into Williams’ universe. What I really liked the most about this book, however, was the attention to the world building. At the back of my copy is a chronology of events that lead up to the book, reminding me much of George Friedman’s book: The Next 100 Years: A Forecast for the 21st Century. There are similar approaches to how geopolitics will shift over the next century, and where Friedman’s book takes the somewhat academic route, Williams takes the far more entertaining one, set in a futuristic world with spaceflight and cybernetics, and ultimately does what Friedman’s book should have: entertain, and present a somewhat plausible view of the future. What also really helped was some of the background information present in the book’s appendix, such as the sequence of events, glossary and character list, but in addition to the information in the book, Williams has put together a fantastic website, which functions not only as a promotional item for the book, but also a reference one as well. Both books share a similar message: the future will hold a number of changes, mostly unexpected, and that nations will act in their own interests, even if that means causing a certain amount of chaos in the world to achieve their goals. William’s future is much the same: rogue interests in a government act in their perceived best interests, seeking to take charge where others have failed, leading to what is set up to be a fantastic storyline overall. At the end of the day, Williams has created a fun book, and a promising start in the genre. While there are certainly a couple of issues that I took from the writing and storytelling, they are more than made up with in the end result: an entertaining, well thought out science fiction/cyberpunk/military SF thriller that really grabs the reader and doesn’t let go until the last page. The Mirrored Heavens is certainly a book that will appeal to the Military SF crowd, but also the video game one, and met with most of my arguments in my article from a couple of months ago with a punch to the head from one of the Razor/Mech teams from the start.